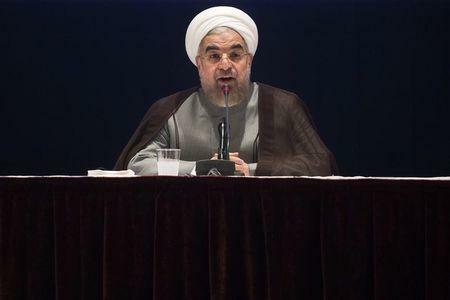 DUBAI (Reuters) - Iranian President Hassan Rouhani, growing frustrated with hardline resistance to a nuclear deal with the West, accused opponents on Saturday of effectively "cheering on" the other side in Tehran's grueling negotiations with world powers. Soon after his 2013 election victory over conservative hardliners, the pragmatist Rouhani set out to end a 12-year nuclear stand-off with the West and thereby secure the lifting of tough sanctions that have crippled Iran's oil-based economy. Iran's ongoing talks with the United States, China, Russia, France, Germany and Britain have gone on for about 14 months and missed a self-imposed November 2014 deadline for a final comprehensive agreement that would limit Iran's nuclear energy capacity in exchange for a phased lifting of sanctions. Western powers suspect Iran is enriching uranium to develop a nuclear weapons capability and want strict curbs and intrusive U.N. inspections to prevent any such outcome. Iran says it seeks only peaceful energy from enrichment. Rouhani, faced with rising popular concern over his unfulfilled election pledges to fix the economy, blamed hardline interference in part for the talks' halting progress. "The other side applauds their own, but here in our country, it is not clear what (the critics) are doing. It is as if they are cheering on the rival team," Rouhani he told a public gathering, quoted by the official IRNA news agency. "And when we ask them what they are going, they answer: 'We are criticizing and criticism is a good thing ... This is not criticism, it is sabotage of national interests and favor for partisan politics," he said. "Criticism is not about booing, it is not about slander and character assassination. Criticism is about showing a better and clearer way so that (we can) reach our goals faster." Hardline sentiment is centered in the security establishment led by the elite Revolutionary Guards and in the powerful Shi'ite Muslim clergy. Supreme Leader Ayatollah Ali Khamenei, Iran's ultimate political authority, has so far backed the nuclear talks but has also continued to denounce foreign "enemies" and "the Great Satan" to reassure hardliners for whom anti-U.S. sentiment has always been integral to Iran's Islamic Revolution. On the Western side, the most significant opponents of nuclear dealmaking with Iran are hawks in the U.S. Congress who want to harden sanctions legislation. Under an interim 2013 accord, Iran halted some sensitive nuclear activity and won limited sanctions relief. The new deadline for a final settlement is June 30.